What is Applied Myoskeletal Soft-Tissue Therapy ? Applied Myoskeletal Soft-Tissue Therapy (AMT) is a gentle, relaxing, and effective, non-oil soft-tissue therapy for the assessment, treatment and management of soft-tissue injury, pain and dysfunction of the musculoskeletal system. The College of Applied Myoskeletal Therapy offers AMT Modular System (6 x 2 days courses) along with a Workshop Series “Cracking the Code to Musculoskeletal Pain” The Pelvis & Lumbar Spine 2 day workshop is the first to be released in the series. Australian Soft-Tissue Therapist John Garfield developed AMT. John’s qualifications include, Cert IV Trainer & Assessor, Diploma of Bowen Therapy, and Diploma of Remedial Massage. John has also trained in Positional Release Technique, Trigger Point Therapy, Cranio-Sacral Therapy, and other neuromuscular-visceral soft- tissue/ manual therapies. 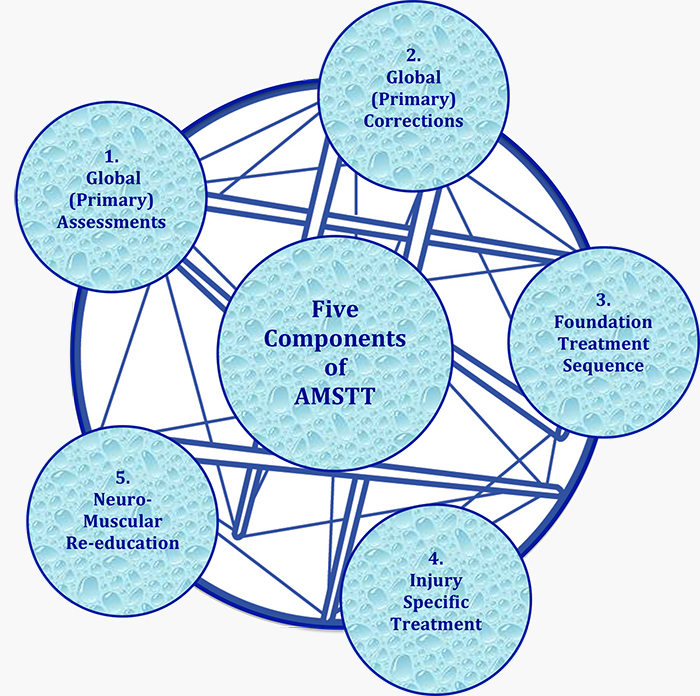 AMSTT is the accumulation of knowledge acquired over fifteen years of combined clinical experience, research, and extensive training. Believing that no one therapy has all the answers, and that soft tissue governs the alignment of the skeleton, Applied Myoskeletal is the bringing together of many effective manual therapy principles, enabling the treatment of many osseous conditions that normally would warrant referral to a therapist trained in joint manipulation. Which types of Soft -Tissue Releases are taught? Techniques are best described as an integration of transverse soft-tissue moves (Which can be traced back to early Chinese Bodywork and made popular by Thomas A Bowen), along with specific soft-tissue holds. The transverse soft-tissue moves do not follow the same sequences found in Bowen Therapy and it is incorrect to think of this new modality as a form of Bowen Therapy, which on casual observation it could be mistaken for. AMT introduces many different treatment philosophies and methods to provide a successful therapeutic response. Other techniques include variations of Muscle Energy Technique, Positional Release Technique, specific Myofascial Release Techniques and in latter modules Meridian Therapy. Pressure is always applied to client comfort on all techniques. Many anatomical structures are influenced including Golgi tendon organs, Muscle spindles, Fascia,CSF, and Meridian energy flow. A treatment is conducted on a massage table with the client fully clothed or draped appropriately. The session can be loosely broken down into five parts. Parts one to three form the Foundation Treatment, as listed below. N.B. A client/ patient history and assessment of injuries, along with health considerations, precedes the Foundation Treatment on the first consultation. It is also essential to re-evaluate their condition on subsequent appointments prior to treatment. Global Assessments: The assessment of important bony landmarks. Please note the word Global in this context refers to the primary muscles capable of causing widespread pain and dysfunction. Foundation Treatment Sequence: A short duration, full body (hamstrings to occiput) sequence of transverse soft-tissue moves, which forms the prerequisite for more specific bodywork. The “Foundation Treatment” includes the pre-mentioned global assessments and corrections incorporated into the full body sequence and it is completed in approximately fifteen minutes. It addresses many areas of the body, especially the pelvis, which is often the underlying cause for pain elsewhere in the body. There are three recommended rest periods for the client/ patient of approximately two minutes intervals. Two rest periods are during, and one is upon completion the Foundation Treatment. Injury Specific Treatment: With the Foundation Treatment now completed it is time to focus on the client’s/ patient’s injury areas more specifically (if required), and also to treat any hypertonic soft tissue areas that were identified during the Foundation Treatment that may require additional attention. Stage four is where many varied methods of sustained soft-tissue holds are employed. Further non-compulsory rest periods are highly recommended at the discretion of the therapist throughout the treatment, and can range from 30 seconds to 2 minutes. Occasionally, longer and/ or more rests can be advantageous. In general those with intense pain, and the frail and sick, require more frequent and/ or longer rest periods. Muscle Re-education: The option of giving the client a daily, take home, Muscle Re-education Exercise, if applicable, to reinforce the clinical corrections is an extremely valuable tool and cannot be emphasized enough. This is very beneficial in chronic conditions where the soft tissue has undergone physiological change to adapt to the stress it is under. Just treating often isn’t sufficient, and although at times stretches or strengthening exercises are beneficial, they commonly are not specific enough to change muscle tone long term and the soft tissue reverts back to a hypertonic state within hours or days, pulling the joint out of alignment again and re-starting the pain cycle.Neuromuscular Re-education Exercises have a high success rate in breaking this cycle. Is it a safe therapy? AMT is one of the safest therapies available. It can be looked upon as one of the many extended follow-on therapies of Remedial Massage, Manual Therapy and Bowen Therapy. It works gently with the body and does not apply force to any skeletal structure nor use high velocity thrust style manipulations. All techniques are safe, non-forceful soft tissue techniques. There is no deep abdominal work. In Australia all practitioners are admitted to the course as postgraduates and are registered professionals with their respective National Bodies. Treatment duration varies according to the condition being treated, its severity, and also the physical condition and health of the client. An Applied Myoskeletal Therapist once trained and familiar with all the moves should be able to complete a treatment within 30 to 50 minutes. Treating two people concurrently can be achieved in 45 to 60 minutes. Treatment duration is a choice of the therapist. AMT treats musculoskeletal pain and dysfunction. Skeletal alignment is achieved via soft tissue – Muscles move Bones. In achieving this it also has the potential to influence the neural, lymphatic, vascular, and meridian systems providing wide spread benefits throughout the body. How do I get the best from AMT? Consistent, quality results are achieved when used as a stand-alone therapy, Buy essay although the inclusion of AMT in any manual therapy treatment will be a valuable addition to a successful therapeutic outcome. Manual therapies that can benefit include Remedial Massage, Bowen Therapy, Kinesiology, Reflexology, Cranio-Sacral Therapy, Acupuncture and Aromatherapy. John Garfield has successfully incorporated AMT into the modalities of Remedial Massage, Cranio-Sacral Therapy, Positional Release Technique, and Bowen Therapy for over ten years, resulting in improved client/ patient outcomes without jeopardizing the underlying philosophies of each modality.